I thought I could do it. I thought I could just wait it out. If I pretended the Harlem Shake didn’t exist, maybe it would just disappear. Maybe it would just go away like Call Me Maybe and Gangnam Style parody videos. Welp, I lasted a few weeks… and today, I’ve caved. I’m finally posting one on Lobshots. This video. These dudes. They’re just having fun. It’s so cool. If it was any other team, they’d be getting ripped in the media, but since everybody knows that Lebron is playing outside of his mind and the Heat are gonna win another title… nobody cares. Let them eat cake. I, for one, am shocked that Lebron has a king’s robe and crown just hanging to wear whenever he has the urge. Shocked. 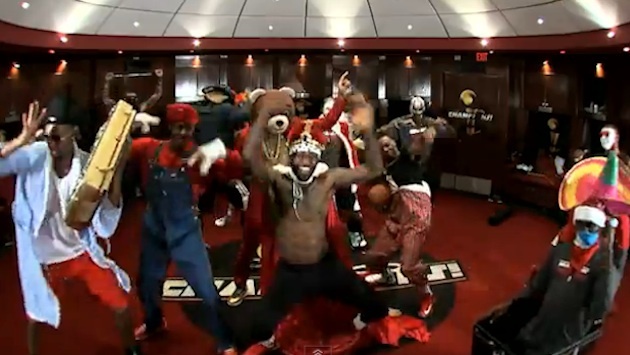 This entry was posted in Basketball, NBA and tagged harlem shake, Heat, heat harlem shake, Lebron James. Bookmark the permalink.